The Who, the legendary British rockers had never actually performed their classic 1969 studio album “Tommy” live in its entirety prior to this 2017 concert which was captured on film at the Royal Albert Hall in London. The Who's first and possibly only ever live performance’s (they played two nights) of Tommy marked the band's 100th benefit concert for the Teenage Cancer Trust, and served as a launch pad for their 2017 Tommy & More Tour, which I had the pleasure to catch in Manchester. The concert is interspersed with interview footage of Roger Daltrey and Pete Townshend prior to the show and includes a bonus behind-the-scenes documentary. Also included are alt-takes on “Acid Queen” and “Pinball Wizard.” The Who know how to reward their fans who have listened to the whole of Tommy with a massive 7 song encore, which included “Baba O'Riley” , “Won't Get Fooled Again" and off course their raison d etre “Who Are You”. Originally planned as an acoustic-only performance of the full Tommy record, it's mentioned right at the beginning that it would've taken "three weeks of rehearsals" and cost too much to make it worthwhile in regards to the charity. This is a real pity, as I guess everyone, including the charity would have welcomed an acoustic set, even just for one night. Maybe make up the loss from other nights of the tour? As it is the band power through this concert with consummate ease, ever the professional Roger lets Pete do the talking with his magic guitar, backed up by power house drummer Zak Starkey. Jon Button is on bass for this show instead of The Who's usual touring bass player Pino Palladino, and he does a fine job of keeping everybody in check. It’s a shame "The Ox" wasn’t around to witness this event. The Who rehearsed Tommy for only about a week before this show, and there is a caution to the songs at times as a result. Tommy is very much Pete’s baby and as such the band are always looking to him for guidance, it is as he may walk off stage or cancel the whole thing at any time. Pete Townsend spoke after the band had finished “We’re Not Gonna Take It”, he said to the audience “I was abused as a child and find a lot of this stuff really hard to hear and really hard to play” and then followed this up with “I’m not going to play Tommy very often, I find it much too hard”. Very emotional times indeed. The sound and picture quality are superb, as you would expect and finally getting the chance to hear tracks like Townshend's superb instrumental "Underture" and Daltrey's vocal turn on the ballad "Welcome” really do raise the hairs on the back of the neck. All in all a superb live video that you will watch over and over again. 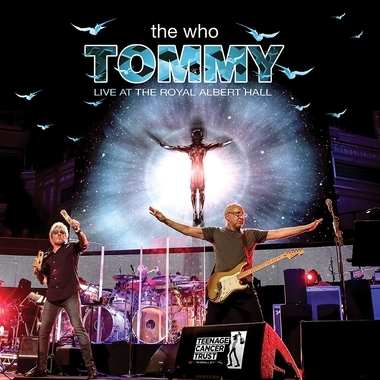 The Who – Tommy Live At The Royal Albert Hall is release on all formats on 13 October 2017 via Eagle Rock.